Forty paintings stolen by nazis and recently reclaimed from the Dutch government are currently on view in the traveling exhibition: Reclaimed: Paintings from the Collection of Jacques Goudstikker at the Bruce Museum in Greenwich, Connecticut through September 7, 2008. The exhibition will also travel to the Jewish Museum in New York and be on view from March 15, 2009 – August 2, 2009. Marei von Saher, Jacques Goudstikker’s daughter-in-law, recently won a tedious eight year battle with the Dutch government for restitution of 200 paintings valued between $79 – 110 million. Many of the works were auctioned off in 2007 to fund the continued search for hundreds of paintings that remain missing, including works by Goya, Van Gogh, Rembrandt, Titian, Rubens, and Tintoretto. The Dutch-Jewish Jacques Goudstikker was a famous and very well-respected art dealer in the Netherlands between the two world wars, specializing in Old Master paintings and selling works to such world class institutions as the Metropolitan Museum of Art. His gallery was in the chic Herengracht district and he lived a stylish life, entertaining frequently and splitting his time between the city and his castle, Nyenrode. In May 1940, Mr. Goudstikker’s reality was turned upside down when the nazis invaded the Netherlands and he was forced to escape with his wife, Desirée, and young son Eduard. In a terrible twist, he successfully boarded a ship to escape the nazis but was tragically killed when he broke his neck falling through a trap door. Mr. Goudstikker’s gallery and other assets were seized by Hitler’s air force chief, Reichsmarschall Hermann Goering, who also happened to be an avid art collector with an eye on Mr. Goudstikker’s important inventory. He personally selected 800 of the best paintings which were sold by force at a fraction of their value. After the war, the paintings that were recovered by the Allies were supposed to be returned to Mr. Goudstikker’s wife but instead, they ended up in Dutch collections until last year. 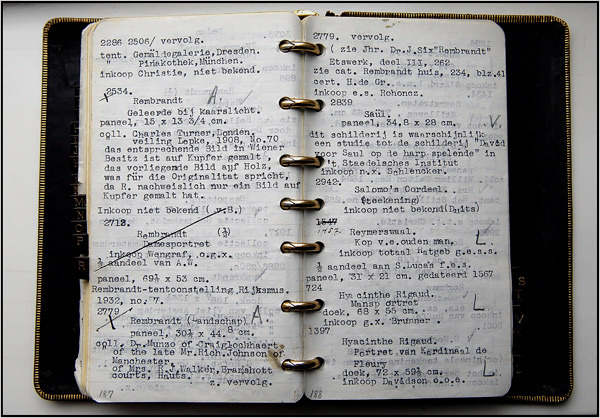 Luckily, Mr. Goudstikker painstakingly catalogued his entire inventory in a black notebook (pictured, above) that was with him when he died, brought to the U.S. by his wife, and later used in the von Saher trial. It is obviously a useful tool in the continued search for the missing paintings. Happily, the von Saher trial proved to be one of the most successful restitution claims of art stolen by the Nazis. We can only hope that these restitution cases will continue to restore looted art to their rightful owners. like yours. It’s pretty value sufficient for me. In my view, if all webmasters and bloggers made excellent content as you probably did, the net shall be much more helpful than ever before. If you wish for to take a great deal from this paragraph then you have to apply such strategies to your won weblog. Its like you read my mind! You appear to understand so much about this, like you wrote the e book in it or something. may anyone get that kind of information in such an ideal means of writing? Its simplicity and solid finish gives it a look and feel that it would last forever. Something similar applies to Samsung’s range of 6, 7, and 8 series LCD HDTVs. overtaken them in many international markets. A number of them are rife with spelling issues and I to find it very troublesome to tell the truth then again I’ll surely come back again. Hey There. I found your blog using msn. This is an extremely werll written article.